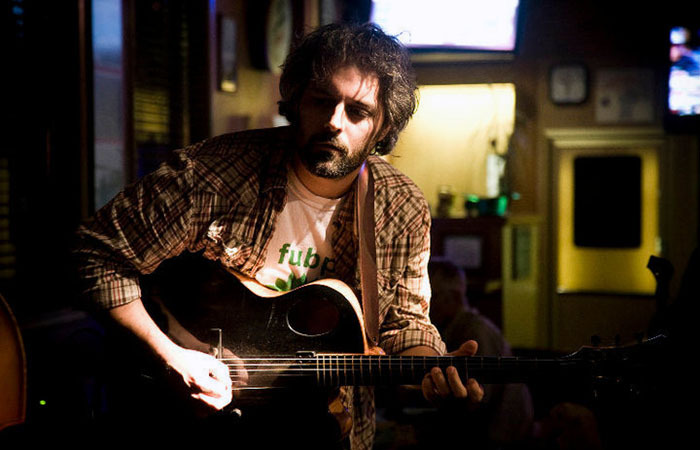 Gordon Grdina is a Vancouver-based oud, bouzouki and guitar player of unbridled musical ingenuity. Few musicians—especially guitarists and oud players—have a vision as broad and seemingly limitless as him. Moreover, he is a lyrical player on every instrument as well. His musical language is poetic; not the indulgent kind, but concrete. His lyricism enables him to play notes that ululate although he employs little tremolo. Mr. Grdina also has the almost magical ability to turn the oud, an instrument on which like other lutes—ancient and modern—notes tend to die quite soon after they are played, a cross between a plucked and a bowed instrument. Thus the notes hang endlessly and dally interminably—pirouetting like dervishes and setting off a myriad of mad desert hares, prancing off as if spooked by the bells and finger cymbals of the dancers. This, in turn makes for musical phrases of extraordinary metaphor and gesture; and as Mr. Grdina’s playing is informed by exquisite touch and brilliant dynamic, every note; then phrase and finally long, loping lines sound as they were awash in a palette of wet colours and even more magically so, imparted with a myriad sounds—in sixteenth, eighth, quarter… beautifully bended notes. In addition Gordon Grdina can make whole cultures collide in his music; from the Middle East and India, where music is rooted in the past, to Europe where polyphony abounds and to Africa, where—at he hands and feet of Kenton Loewen—the heart of polyrhythms is exposed. So much for the beauty of No Difference a wonderful, brooding excursion into the deepest recesses of the musicians’ soul. It is also important to see this 2013 recording as an evolution from Mr. Grdina’s 2012 recording Her Eyes Illuminate made with a substantially larger group called “Haram” (Arabic for “Forbidden”). In the first recording there is a visceral energy that runs deep and throughout. It is not the kind of visceral energy that comes from musical effects; rather it is that the notes are actually infused with a palpable energy that makes them growl and buzz or whisper and slur—depending on the emotional narrative of the phrase. Contextually this may have been made possible as Mr. Grdina seems to have been moved by like in a spiritual manner; perhaps he may even inspired, albeit involuntarily, by the epic and fearful nature of Dante Alighieri’s Inferno in which the soul seeks to ascend from hell through purgatory into the Heavens—the musicians’ Valhalla. The oud player is ably assisted in this musical regard by the extraordinary drummer Kenton Loewen—a veritable master of polyrhythms, who, as some soli suggest, has descended directly from Max Roach—and by the bassist, Mark Helias, who brings a rumbling gravitas to the session; as well as tenor saxophonist Tony Malaby, whose moist hot tone is perfectly suited to the material that resides in the lower registers of music. Tossing lines like harpoons, Mr. Malaby and Mr. Helias make the music sound forbidding as well as alluring, while Mr. Grdina plays his role as a modern-day Pied Piper of Hamelin to the hilt. “Hope in Being,” “Limbo” and especially “Nayeli Joon,” “Fierce Point” and “Visceral Voices” are pieces that typically describe the exquisite, yet terrifying energy of the recording, which marks Gordon Grdina as one of the truly important voices in music today. Track List: Hope in Being; Limbo; The Throes; Leisure Park; Fast Times; Nayeli Joon; Cluster; Fierce Point; Visceral Voices. Personnel: Gordon Grdina: oud, guitar, bowed guitar; Mark Helias: double bass; Kenton Loewen: drums; Tony Malaby: tenor saxophone. Gordon Grdina treads on much more dangerous ground here, venturing close to the heart of tenants proscribed by the elders of Islamism. As Mr. Grdina has already stated his intention to focus on the profane and not on the sacred, the music of this recording will dwell outside that realm, but is no less spectacular. It introduces the vocal element to the repertoire hat consists of music from the pen of the great Syrian-Egyptian “King of Oud” Farid al-Atrash and one of Lebanon’s favourite sons: Ziad al Rahbani. Expanding his ensemble to include saxophonist Chris Kelly, trumpeter JP Carter and clarinetist Francois Houle along with the mercurial Jesse Zubot on violin, the vocalist Emad Armoush, who captures the very essence of Mr. Grdina’s teasing ebullience on charts such as “En Shakawt Al Hawa (If You Complain About Love)” and the heartfelt melancholia on “Che Mali Wali (Because I Am Abandoned)” with breathtaking beauty. The howl of JP Carter’s trumpet and the ethereal beauty of the Turkish ney add to the exquisite nature of the music. These charts are significant because it is a musical forbear to much of what Mr. Grdina has composed and presents in his later album, No Difference. Conceived with all the complexity of an inharmonious Arabic chart, which the oud player has adapted for a larger ensemble with a choral element, Mr. Grdina has prepared his listeners for the sparer sinews of that 2013 quartet recording. Here too, his oud playing is exquisite and although he is on point with his melody, his colours and shades and so magical and invite the broad use of the imagination to go much further with the music cuts through the mundane into a realm that is spectacular and utterly beautiful. It is clear that Mr. Grdina’s music is entirely modern, yet utterly timeless. Track List: Raqs Al Jamal (Dance Of Beauty); Tilli Edhakilo (Go Out And Laugh With Him); Sharpening; En Shakawt Al Hawa (If You Complain About Love); Alf Leila Wa Leila (A Thousand And One Nights); Sama’i Farahfaza; Ana Wa Habibi (Me And My Love); Laktob Aourak Al Chagar (I Will Write To You On The Leaves Of Trees); Che Mali Wali (Because I Am Abandoned); Longa Farahfaza. 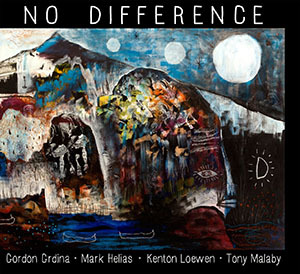 Personnel: Gordon Grdina: oud; Chris Kelly: tenor saxophone; JP Carter: trumpet; Francois Houle: clarinet; Jesse Zubot: violin, electronics; Tommy Babin: electric bass; Kenton Loewen: drums; Emad Armoush: vocals, ney; Tim Gerwing: darbuka; Liam MacDonald: riq.